On our way back from our "psych up the Saints" Louisiana style brunch at Acme we were feeling something a little sweet. We had another hour or two before the Superbowl was going to start so we decided to walk home and stop by Black Hound bakery. They had their regular line of cakes in the window as well as some special ones just for Valentines day. 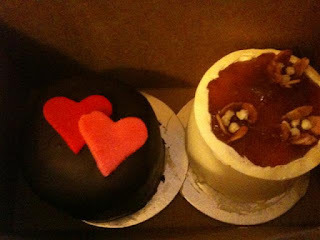 We decided to buy two- Valentine Busy Bee Cake and the regular Almond Apricot. The Busy Bee cake is one of their most popular items. It has three layers of chocolate cake, two layers of almond cake, two layers of chocolate mousse and a layer of marzipan. I probably wouldn't have ordered this cake on my own because of the marzipan but it really wasn't too bad. The marzipan was mostly on the bottom so I just avoided it and enjoyed the deep chocolaty deliciousness of the rest of the cake. Yum! The Almond Apricot cake was wonderful as well but it too had marzipan! The cake itself was an almond marzipan cake! I can't believe I actually liked it! Maybe my intense dislike for this flavor is waning? I don't know. Maybe it was just that the white butter cream and apricot was so good it detracted me from the marzipan. Well anyway they were both quite delicious. Happy Valentines Day! Hi Katie! Glad you enjoy my blog. Not exactly sure what kind of ideas you're looking for. Can you give me a little more information? Are you looking to hold a formal Valentine's day party? I do know that Eleni's in the Chelsea market has all of their Valentine stuff at 50% off right. There are some good deals to be had.